I thought the Google Nexus tablet was good value, and compared to an Apple iPad or most other tablets out there it is, but for sheer capability on a budget a desktop PC has it beat. The total cost was £128.54 with free delivery. I then plucked a Sata DVD drive and a 200GB hard drive from a dead server, and put it all together, which took less than an hour. Next installed Windows 7 64-bit, for which fortunately I have a subscription license. Plugged in spare keyboard, mouse and monitor. I was impressed by the Windows Experience Index of 4.9, and Gaming graphics of 5.6 achieved by Intel’s integrated graphics. The board has VGA and DVI ports and supports dual displays. It also has HD audio and of course ethernet networking. What would it cost if I had not had spare DVD and hard drives? A 500GB drive is £42.70 and a DVD drive £11.94 currently, making £183.18, or £152.65 without the VAT. Need Windows? You are a system builder, so you can get Windows Home Premium with SP1 64-bit for £75.99, or Professional for £104.98. Total cost with the cheaper option is £259.17, now more than a Google Nexus tablet (£159.00 for the 8GB version). Add a screen, keyboard and mouse for £65.97 (BenQ LCD 18.5” 1366 x 768), and the complete system is £325.14, or £249.15 if you stick Ubuntu on in place of Windows 7. Still, I’d bet that the average household has at least some reusable bits lying around. The real point is how capable even a budget box like this turns out to be. The RAM is upgradeable to 16GB. The dark side to all this is that the value of your old PC has plummeted since you bought it three or four years ago, and faults beyond the trivial are hardly worth repairing. Finally, I should mention Raspberry Pi. The board complete with CPU, networking and graphics is £25.92. Add case, 4GB storage, power, keyboard, mouse, and HDMI monitor though, and my quick price for the complete system is £147.81, mostly for the monitor (Benq 21.5” HDMI). Of course there are many creative uses for a Raspberry Pi without buying a monitor. My vote still goes to the PC for the best productivity on a budget. PS let’s not forget the cheapest Mac, currently a Mac mini at £529. OS comes with it, but only 2GB RAM, no mouse, keyboard or monitor. Add those and it is over £600. Tablets, laptops, smartphones: which form factors will win? There have been several thoughtful pieces recently on device form factors and what you can and cannot easily do with tablets versus laptops versus smartphones. Richard Gaywood says the iPad (it’s an Apple site) is “heavily skewed towards, but not entirely about, consumption” rather than creation. His observation is based partly on app statistics, partly on the lack of a keyboard (if you add a Bluetooth keyboard, he argues, an iPad becomes as bulky as a laptop), and partly on weak multitasking and the lack of an accessible file system. I spent several months back in 2010-11 carrying around the original Samsung Galaxy Tab, which may have only been Gingerbread, but included a first-rate phone, and my handset rarely left my pocket. John Gruber writes at unusual length about why Apple might or might not do a smaller iPad. On the eve of the Windows 8 launch this is an interesting discussion. Windows 8 will renew the debate: is a tablet all I need, at least when travelling? And where will Google’s 7” Nexus fit in? I foresee this selling well simply because it is great value, but will it be packed in the flight case alongside a laptop and a phone, or left at home, or could it even replace laptops and bigger tablets? We in the the great unknown; but I will make a few predictions. First, laptops and indeed desktop applications (that is, not apps) are in permanent decline. That does not mean they will disappear soon, just that they will be used less and less. The implication is that tablets will be used for content creation as well as consumption, and for work as well as for play. Will developers and designers still want huge multi-display setups? Yes, of course; but most people will get most of their work done with tablets. Second, that unadorned tablets will win over complicated solutions like laptops with twisty screens (the old Tablet PC concept), styluses, transformers, and the like. My guess is that we will see lots of clever and expensive Windows 8 x86 devices that will only achieve niche sales. The ones that succeed will be the slates, and the traditional laptops. Third, there may be merit in the keyboard case concept, particularly when the keyboard is very thin, as in Microsoft’s Surface with Touch Cover. On the other hand, keyboard cases that make tablets into laptops, like one I tried for the iPad, also tend to give tablets the same disadvantages as laptops: clam shell design, difficult to use without a desk, and so on. I have found that I prefer a loose keyboard in my bag. It does not take much space, and does not get in the way when not needed. What about mid-sized devices like the Nexus? I am not convinced. They are too small for all your work, and too big to be phones. The large-size Smartphones like Samsung’s 5.2-inch Galaxy Note sort-of work: they sell to people who do not mind having a large phone. But most of us will end up with two devices in constant use, a phone and a tablet. In the office or study, add a large screen and keyboard to taste. The Register ran two online discussions on Windows 8, in which I participated along with Mary Jo Foley and Gavin Clarke. I personally think Windows 8 can’t bag Microsoft the kind of runaway success they had with Windows 95 or XP. It’s going to turn off many PC users and the success of Windows tablets is uncertain. I definitely want one. iPad for kids, Surface for grown ups. First bit of kit I’ve wanted in years. Close up with Asus PadFone: is a converged device in your future? Asus held an event in London to show off the devices it revealed at Computex in Taipei recently, though sadly there was no Windows RT device to be seen. Among the Zenbook Ultrabooks and Transformer Primes there was something innovative though, which was a near-final sample of the PadFone, which combines smartphone, tablet and Android laptop into one package. The thinking is simple: why have an expensive smartphone as well as an expensive tablet, each perhaps with its own SIM card and contract, when the smartphone can power both? In the PadFone, the phone docks into the tablet, and the tablet clips into a keyboard case. As a final flourish, there is an optional headset stylus, a stylus with a Bluetooth headset built-in so you can answer the phone easily when it is docked. The tablet, note, is useless until you dock the phone. You do this by opening a flap on the back and dropping it in. The tablet then works just like any other Android tablet, though it is heavier than average, and has a bulbous section on the underside. Attach to the keyboard case, and you have a laptop. The tablet has a 10.1”, 1280 x 800 screen with Gorilla Glass, a speaker and headphone jack, and a front-facing camera. The phone has 1GB RAM, 16GB flash storage plus Micro-SD support, Qualcomm 8260A Snapdragon S4 Dual-core processor with Andreno 225 GPU, rear camera and its own front-facing camera, and runs Android ICS. The keyboard adds USB ports and a card reader. Each device has its own battery so a full setup has three batteries, or four if you count one in the stylus headset. However you can have scenarios where the tablet is out of power but the phone is not, for example, which would be annoying. I spent some time with the PadFone, scribbling on the excellent note-taking app which comes with it, and assembling and disassembling the unit to get a feel for how it works. There is plenty to like. The phone itself looks great and seems fast and capable. Docking and removing it is straightforward, particularly since the flap acts as a lever to eject the phone gently. Asus assured me that it has been tested for thousands of insertions. The tablet worked well too, though it is heavier than most and the protrusion which holds the smartphone is inelegant. A winner then? I am not sure. It is interesting and innovative, but the mechanics need some refinement. Most people have a case to protect their smartphones, but for the PadFone you will either need to remove the phone from its case when you dock it, or else treat the tablet as the case, in which case it will not slip so easily into a jacket pocket or handbag. The stylus headset is not just a gimmick; you will need this, or another Bluetooth headset, to make sense of using the phone when it is docked. Some variations on this theme occur to me. After another generation of miniaturisation, perhaps you could design a phone so slim that it fits into the case more like an old PCMCIA card used to slot into a laptop, without an ugly protruding flap? Another idea would be to make all the communication between phone and tablet wireless, building just enough smarts into the tablet that it works as a kind of remote desktop into your phone. The Asus folk present told me that the PadFone is first-generation and we can expect the concept to evolve. Another goal is to make a splash in the smartphone market, using the PadFone as differentiation from all the other Android devices out there. Apparently the PadFone will normally be sold on contract, and while it will be bundled with the tablet, whose name is the PadFone Station, the keyboard and stylus headset will be optional extras. Prices for SSDs (solid-state drives) are falling and capacity is rising, so much so that fitting one now looks eminently sensible if you value performance and can manage with a bit less space than a hard drive offers – though note that you should really run Windows 7, or on the Mac OSX Snow Leopard or later, as these operating systems support SSD TRIM, improving performance by telling the drive which blocks of data are no longer in use and can be safely deleted. The primary benefit of SSD is performance, but you also get silent running and lower power consumption. This Kingston kit is a generous bundle, suitable for converting a laptop or desktop. It includes a USB-powered external disk caddy which assists with the transfer of your existing data as well as enabling you to continue using your old laptop drive for external storage if you wish. There are also brackets and cables so you can fit the drive into a desktop PC, and a CD containing an Acronis disk clone tool. The recommended method for installation depends on whether you are upgrading a laptop or a desktop. The first step is the same for both and may be the hardest: reduce the size of the data on your existing drive to less than 240GB. Next, if you are on a laptop, you remove the existing drive install the SSD, fit the existing drive to the caddy and connect it with USB, reboot using the CD, boot into Acronis and clone the existing drive to the SSD. If you are on a desktop, your existing 3.5” drive will not fit into the caddy, so you fit the SSD to the caddy, connect, reboot into Acronis, clone the existing drive to the SSD, and then switch off and replace the existing desktop drive with the SSD using the brackets provided. For this review I used the former approach but either should work well. On a three-year old laptop running Windows 7 64-bit I was rewarded with a Windows Experience Index for the hard drive of 7.7. However, this laptop only has SATA 2, whereas the drive supports SATA 3 and would work faster if this were available. Kingston quotes 480 MB/s for sequential writes and power consumption of 0.565w idle rising to 2.065w for writes. If you do not need the kit you can get the SSD a little cheaper on its own. An excellent kit though, and the Acronis cloning solution is cleaner than others I have seen which require software to be installed in Windows. I made a brief visit to the Valley Fair mall in San Jose yesterday and took a quick look at the Microsoft and Apple stores. Many new PCs come filled with lots of trialware and sample software that slows your computer down—removing all that is a pain, so we do it for you! So much for the famous Windows partner ecosystem, eh! But I reckon this is worth the extra cost for most people. 1. It was a quiet Monday afternoon and none of the stores was busy. 2. I guess San Jose is Apple land; certainly I have not seen the Seattle store this quiet. Nevertheless, there did seem to be a mismatch between the numbers of staff and customers. When I went in I was offered help three times and a free drink once. The guy in yellow at the front left is protesting about some alleged Microsoft misdemeanour. The Apple store was not exactly heaving and there were plenty of blue shirts, but a few more customers. Here is the problem: you are typing on your laptop and suddenly the input cursor jumps to a different place and you are typing somewhere in a previous paragraph. It is infuriating and there are long threads on the subject on Microsoft Answers here and here, for example. I have just been speaking to a user with exactly this problem. The clue: he had recently created a new profile, which resets your Windows user settings to the default. The answer was simple. 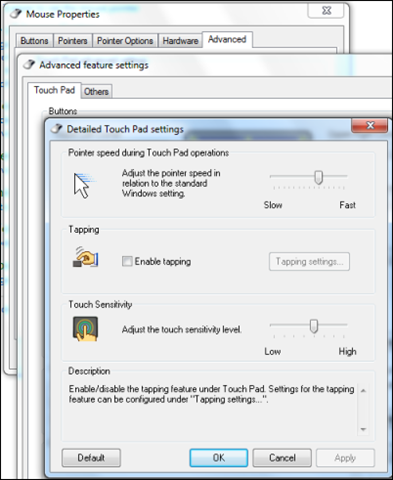 Laptops have touchpads or trackpads which have a feature called tapping. Just tap with the finger and it registers a mouse click. Double tap and it registers a double-click. Nice idea, but it is a vile feature for some – possibly most – users since it is so easy to trigger accidentally. Anything might happen: emails sent by mistake, documents closed, buttons clicked, and so on. It is as if your computer is being remote controlled by a malevolent third party, especially if you have a slight tremor for any reason. Go to Control Panel, Mouse, Change Mouse Settings, Advanced tab, click Advanced Feature Settings, then click Settings under Detailed Settings for Touch Pad operations, then uncheck Enable Tapping. The path may be different for you, particularly if you have a different brand of touchpad. The above is for a Synaptics; Alps has different dialogs, for example. Poke around in mouse settings until you find it. The setting “Disable tapping while typing” is not sufficient for some reason. Why does this make your cursor jump, even if you do not use your touchpad? It is the vibration from your typing that is enough to trigger a tap on some machines, registering a “click” wherever the pointer happens to be (and the pointer is usually hidden when typing, making this appear even more mysterious). The question which puzzles me is why this annoying feature is enabled by default, when it should be disabled, and second, why it is so hard to find the setting, when it is something that many people need? I imagine this single feature has driven some users to the Mac. Most users never discover the fix, but just have the impression that Windows is buggy. Is it worth replacing your laptop’s hard drive with a solid state drive instead? If you can put up with a few limitations (and perhaps a smaller drive) then it probably is. SSD is faster than a spinning disk, and you will notice this in the form of faster boot, faster application loading, and a snappier system in general. Battery life may improve too. This review covers the Samsung 830 series 128GB SSD, specifically the laptop installation kit which contains all you need (except the screwdriver). Laptop drives are usually easy to replace physically, but migrating your operating system can be tricky. Samsung seems to be making an effort to simplify this, though it could do better. The essentials are here though, particularly a very handy cable that lets you connect your new SSD as an external USB drive. This means you can image your existing drive to the SSD, then replace the drive and boot as normal. The package also includes two CDs, one for Norton Ghost and the other for some utilities and documentation. Finally there is a short printed manual and of course the drive itself. Since it is thinner than a hard drive, a spacer is supplied which bulks it out to the size of a standard 2.5” drive if necessary. The laptop I picked for this test is a Dell running Windows 7 64-bit. It has a 160GB 7200 rpm Seagate drive – typical of a laptop which is a few years old. Curiously, although all the kit is supplied to migrate from your existing hard drive, there is a note in the instruction leaflet that says “Samsung recommends that you do a fresh OS install to ensure an optimal operating environment for your new SSD”. Good advice, except that laptops usually do not come with Windows install media, and if they do it is recovery media with recreates the original install, which is not quite the same as a fresh install. Another problem with a fresh install is the time-consuming job of reinstalling your applications. There are many advantages to migration rather than clean install, even if the final result is not optimal. You can also tweak an existing Windows install for SSD so it is not that bad. A problem with this kit is that although it does have all you need, it lacks a simple step by step guide. That is not for want of trying; someone has worked hard on the interactive manual on one of the CDs. Even so, with a printed manual that covers both desktop and laptop versions of the kit, two CDs, Samsung’s Magician utility as well as Norton Ghost, it ends up being a confusing bundle. Most laptops only have one drive, and you may well find that there is more data on your current drive than there is space on the new SSD. I recall a note somewhere that advises you to delete unimportant data to make space. Alternatively, you could get Samsung’s 256GB kit for around twice the price. On a desktop, you would likely use an SSD drive for booting and for the operating system, but conventional hard drives for data. Norton Ghost is not my favourite disk utility. It is a backup tool as well as a drive cloning utility, and has a rather complex and intrusive install. An alternative is to use the backup and restore built into Windows 7, which would work fine for this although you will need an additional external drive as well as a Windows restore CD or bootable USB device. There are also leaner tools such as Drive Snapshot which work well. Still, for this review I decided to use the tools in the bundle and installed Norton Ghost. The Ghost install flashed many command prompts at me and then hung for ages doing apparently nothing. I gave up, tried to cancel the installation without success, and rebooted to find that the install had apparently succeeded. I did not trust it so did a repair install which did complete, giving me reasonable confidence that I had Ghost installed OK. If you go the Ghost route, you should read the document called NortonGhost_Data_Migration_User_Manual_(English).pdf which is in the MagicianSoftware folder on the Samsung Magician CD. The main issue is that Windows 7 creates a hidden system partition which you need to copy to the SSD *first*, otherwise Windows 7 will not boot. I then attached the SSD drive with the supplied USB cable and ran Ghost to copy the partitions. It took around two hours for my 100GB of data. I then switched the drive with the hard drive installed in the laptop. This was pretty easy, though I did need the supplied spacer in order to press the hard drive close enough to the case for the stubby screws to bite. Booted up, and Windows warned that it had not been shut down properly. I chose a Normal start, Windows detected the new drive, reconfigured itself, and requested a further restart. That was it. Well, not quite. I ran Outlook which decided it had to recreate its offline cached mailbox completely. Mine is huge so that took a while. I also used the Samsung Magician utility to optimize Windows for an SSD install. This utility tweaks a few settings, such as disabling Super Fetch. It also recommends disabling the Windows indexing service. The idea is to reduce the number of disk writes, bearing in mind that SSDs gradually wear and their capacity reduces as data is deleted and written. There are other Windows tweaks you can make to optimize for SSD. Tom’s hardware has a handy list here. Note that there are trade-offs. Disabling the indexing service may be a good idea for the SSD, but can be inconvenient, particularly if you use Outlook whose search depends on it. Disabling System Restore means you lose its benefit if something in Windows gets corrupted and will have to resort to other restore methods. A glance tells you all you need to know: the SSD is much faster. The Disk Mark improves by 931%. In use the laptop feels like a new machine; everything happens faster than before. It is worth the hassle. Acer has announced its AcerCloud in the run-up to CES in Las Vegas. This is a service that spans mobile devices, PCs and the internet, the aim being that pictures, documents and multimedia are available from any device. Take a picture on your smartphone, and it appears seamlessly on your PC. Download a video to your PC, and view it on your tablet. Play music stored at home from your tablet while out and about. Professionals can update sales documents on a PC and save them, and the documents will be put into the personal cloud and streamed to other devices. They can then go to their meeting with their notebook or tablet PC and have immediate access to all the updated files. The files will be temporarily accessible for 30 days in the personal cloud and on the devices, or they can choose to download the files on to other devices for long-term storage. As long as the main PC is in sleep (standby/hibernation) mode, Acer Always Connect technology can wake it up through Wi-Fi® so media can be retrieved via a mobile device. This whole thing would work better if the cloud, rather than the home PC, were the central repository of data. A PC or notebook sitting at home is unreliable. It has a frail hard drive. It might be a laptop on battery power, and the battery might expire. The home broadband connection might fail – and most home connections are much slower uploading to the internet than downloading from it. Another question: if you one of the professionals Acer refers to, will you want to put your faith in AcerCloud for showing documents at your business meeting? Acer wants to differentiate its products so that users seek out an Acer PC or tablet. The problem though is that similar services are already available from others. DropBox has a cloud/device synchronisation service that works well, with no 30 day expiry. Microsoft’s SkyDrive is an excellent, free cloud storage service with smart features like online editing of Office documents. Google Music will put all your music in the cloud. Apple iCloud shares content seamlessly across Apple devices, and so on. The problem with this kind of effort is that if it is less than excellent, it has a reverse effect on the desirability of the products, being one more thing users want to uninstall or which gets in the way of their work. AcerCloud will be bundled on all Acer consumer PCs starting Q2 2012. It will support all Android devices, while future support is planned for Windows-based devices. I attended a press briefing for a new kind of portable computing device which its inventors are calling a “laptop” and have been trying out a review sample. Unlike today’s one-piece slate form factor, the laptop has a hinged top which when open forms the screen. The lower piece, called the keyboard, has physical buttons representing the letters of the alphabet, numbers, and other useful inputs, more or less matching the on-screen input panel we are used to. The makers claim that a keyboard is faster to use than an input panel, but I am not convinced. One of the problems is that you are either looking at the screen, or the keyboard, and it takes a lot of practice to type without looking at the keyboard and missing what is appearing on the screen. The real benefit is that without an input panel, there is more space on the screen for the application. Still, bearing in mind that the input panel disappears when not in use, this is not really such a big deal. The downside of the laptop is that the two-piece design makes it bulkier and potentially more delicate than a conventional tablet. I also found that while it works fine on a desk, in a constrained space such as in an aeroplane seat the hinge design is awkward to use, and on several occasions I gave in to the frustration and used my normal tablet instead. If you are standing up, the laptop is horrible to use, whereas a tablet works fine: you can hold it in one hand and control it with the other. Laptops will be more expensive than tablets because of the more complex design, though we were shown a cheaper variant that has a passive screen which does not respond to touch. This is odd to use; at first you find yourself constantly stabbing at the screen by mistake, but eventually you can train yourself to do everything with the keyboard. Just make sure you do not ever switch back to a tablet, otherwise when you come back to the laptop you will find yourself stabbing the screen again! In order to mitigate the lack of touch control on these low-end devices, the designers have added an on-screen pointer which you can think of as a virtual finger. A small area in the centre of the keyboard is touch-sensitive, and moving your finger there moves the on-screen “finger”. You can then tap or click a button to simulate a finger tap. It is a clever idea, though operating at one remove from the screen itself takes some getting used to. In the end though, it feels like a step backwards and for most users the extra cost of the normal touch screen is well worth it. My view: for certain specialist tasks the laptop may catch on, but I cannot see it succeeding in the mass market.